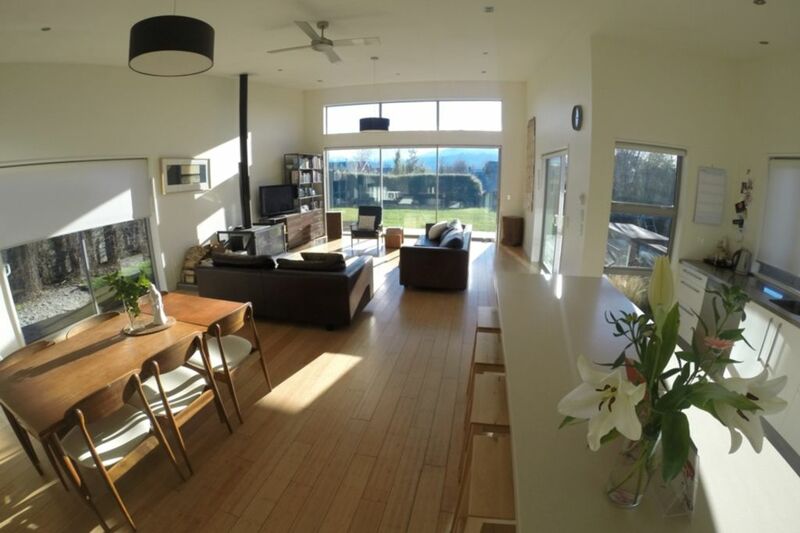 This modern, spacious home has great mountain views from a semi elevated site with warm and comfortable living. The home has fibre wireless broadband, HD TV, a DVD player and stereo. The house has a large open plan lounge/dining room/kitchen. The lounge opens out to the deck and front lawn with outdoor furniture and BBQ. The property is private and fully fenced. High-speed wireless Internet, Sky TV with Sport and Movie Channels. A wood burner, heat pump, heated towel rails and hallway heating keep the house cosy in winter as well as cool in summer. The modern kitchen includes an oven, microwave, dishwasher and a range of modern appliances. The kitchen is well equiped with cutlery, crockery and cooking utensils and serving ware. The house offers good indoor/outdoor flow, comfortable beds and furniture and three bathrooms. The home is located in a private, off street section and a playground/ park is 100 metres away. The lake is a 10 minute walk away and shops 5-10 minutes walk. The cul de sac street is quiet and safe. There are four bedrooms which comfortably sleep 8 guests: a master super king-sized bedroom with ensuite and walk in wardrobe, one queen bedroom with small ensuite bathroom, two other bedrooms, which have twin singles in each bedroom. Upon request we can provide a children’s portacot. A minimum stay of 5 days is required over peak times- school holiday periods. Other times require minimum stay of 4 nights. Fantastic property in ideal location. Very well equipped and amazing outdoor space for young children. Debra was a great host and her home has beautiful interior styling. We will definitely be back. Great layout, beautifully decorated, great views, very private with a super functional kitchen. It was a perfect home base for a Treblecone ski holiday for our family of five. Debra was so helpful and accommodating—nothing was too much trouble. Everything exceeded our expectation. Highest recommendation. Great location. It’s only a short walk through the trees into town. We loved our wanaka ski holiday. The house was fantastic and the owners a delight to deal with. I can highly recommend this property. This property was perfect for our family get together over Easter - We had (2) children at the house and they loved the backyard complete with trampoline and sand pit. The home is beautiful with space for everyone and has absolutely everything that you could need. It is an enjoyable space to relax and unwind. Thank you Debra and Ben for allowing us to stay in your home ... Just perfect.